The top high-school players in the nation impressed everyone during the 2016 McDonald's All-American Game on Wednesday night. The game took place at the United Center in Chicago. As usual, the annual event gave college basketball fans an early look at future stars. There was no shortage of talent heading to the top programs like Kentucky, Duke, Michigan State, and UCLA. Many leading recruiting experts believe the class of 2016 is one of the best ever, and these players did not disappoint. Multiple players scored double digits. It was a true all-star game, short on defense and long on fast breaks, dunks, and three pointers. The players played so well that it was difficult to chose one MVP. Frank Jackson (Duke) and Josh Jackson (undecided but looking at Kansas, Michigan State and Arizona) were named co-MVP. No, these players are not related. It was just a good night for basketball players with the last name Jackson, as each scored 19 points. Frank Jackson also won the dunk contest on Monday night with a 360-degree jam that put it away. Jackson is an impressive 6’ 3” guard from Lone Peak High School in Highland, Utah. He is only the sixth player ever from Utah to be selected to play in the McDonald’s All-American game. Josh Jackson, the 6’ 7” wing that played in high school at Prolific Prep in Napa, California, really stood out. He is known to be thoughtful off the court, enjoying pastimes such as chess and playing the saxophone. However, on the court, he is a proud trash-talker. I wonder if he trash-talks in chess. After last night’s performance, Josh’s hometown school, Michigan State, is likely hoping that he will decide on the Spartans. Also, he would be joining another standout from last night’s game, Miles Bridges. These players would form a deadly backcourt for the Spartans. For the East, Lonzo Ball (UCLA) tied a McDonald’s All-American game record with 13 assists. In my opinion, his middle name should be “can.” His incredible passing skills helped lead his team to victory. Ball is the eldest of the three famous Ball brothers from Chino Hills, California. The 6’5” guard led his high school team to a ridiculous record of 35-0 this year. The high scorer for the East was Jayson Tatum, finishing with 18 points. Tatum is a 6'8” wing from Chaminade College Prep in St. Louis. He won both a state title for his high school and a gold medal for the United States Olympic team at the 2015 FIBA U19 World Championship. In the ESPN 100, Tatum is ranked as the #2 recruit. He will be joining his best friend Harry Giles at Duke next year. As the #1 recruit, Giles is the only person ranked above Tatum. Giles did not participate in the McDonald’s All American game because he is recovering from a torn ACL. Bam Adeboyo was close behind Tatum at 16 points and 12 rebounds for the West. He will be an outstanding big for Kentucky next year at 6’ 9” and 230 pounds. 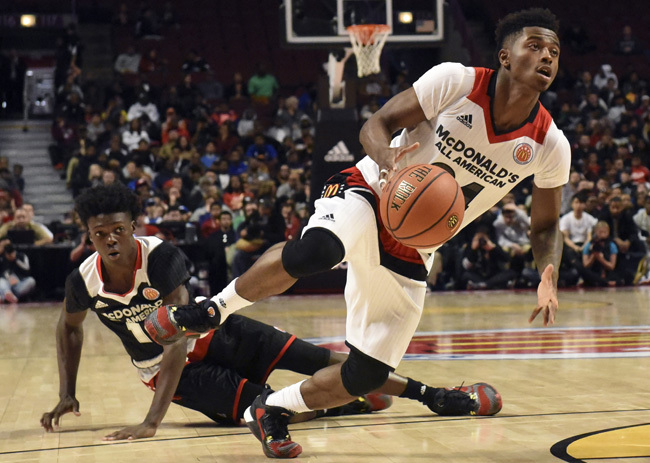 The 2016 McDonald’s All American game showcased an outstanding level of talent as almost every player put on a show. A lot of these players already look like experienced NBA players. Some could be declaring for the draft just a year from now. Enjoy them while you can, college basketball fans.